King’s Health Partners and an innovative technology company called Buddi, have combined forces to help prevent type 2 diabetes. The collaboration is launching a new trial to see if wearable technology and a mobile app could improve health outcomes for people with pre-diabetes. The year-long randomised control trial is due to start in September and will work with 200 patients in the London boroughs of Lambeth and Southwark. The ultimate aim of the project is to prevent those with pre-diabetes from developing the disease by promoting healthy lifestyle changes. It is estimated that more than 1 in 3 of the UK adult population are at an increased risk of developing type 2 diabetes. 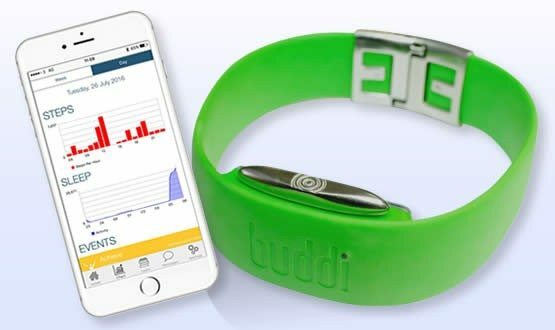 The patients involved with the trial will sport a Buddi wristband in combination with a mobile app designed to promote physical activity and healthy eating – two important risk factors for type 2 diabetes. The app will collect data on activity, eating behaviours and diabetes management and send back supportive and motivational messages to encourage the patient to adopt healthy behaviours. “In the face of the explosive growth of the obesity and type 2 diabetes epidemic, not only in London but globally, continued innovations in clinical services are required and the NHS is in need of new cost effective tools, ” said Professor Khalida Ismail, co-leader of the King’s Health Partners Diabetes Clinical Academic Group. Diabetes is one the fastest growing health threats of our times and an urgent public health issue. Since 1996, the number of people living with diabetes in the UK has more than doubled. Type 2 diabetes currently causes around 22,000 early deaths in the UK each year. “The NHS spends almost 10% of hospital expenditure on treating diabetes and diabetes related complications. We are helping to develop a solution to enable healthcare professionals to shift their focus from reactive treatment to preventative measures,” said Sara Murray, Chief Executive and founder of Buddi. WELL.. In July of 2015. it was discovered that I got type 2 diabetes, By the end of the July month. I was given a prescription for the Metformin, I stated with the ADA diet and followed it completely for several weeks but was unable to get my blood sugar below 140, Without results to how for my hard work. I really panicked and called my doctor. His response?? Deal with it yourself, I started to feel that something wasn’t right and do my own research, Then I found Lisa’s great blog (google ” HOW I FREED MYSELF FROM THE DIABETES ” ) .. I read it from cover to cover and I started with the diet and by the next morning. my blood sugar was 100, Since then. I get a fasting reading between the mid 70s and 80s, My doctor was very surprised at the results that. the next week. he took me off the Metformin drug, I lost 30 pounds in my first month and lost more than 6 inches off my waist and I’m able to work out twice a day while still having lots of energy. The truth is that we can get off the drugs and help myself by trying natural methods..